The Richter Optica HS-2D is a digital compound biological student microscope used in high schools. 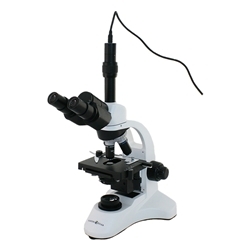 This model has cool LED illumination and a mechanical stage and provides 1000x magnification. Objective Lenses: DIN standard Achromat 4x, 10x, 40xR, 100xR oil immersion objectives are parfocalled, parcentered, color coded and mounted in reverse facing quadruple nosepiece. 30° inclined binocular viewing head rotates 360°. Trinocular port holds digital camera. Eyepieces: Widefield 10x eyepieces, FN18. Interpupillary adjustment 55-75mm. Eyepiece can be fitted with a 20mm diameter reticle. Call for info on reticle retaining ring. Camera & Software: 3 Megapixel eyepiece camera connects via USB and is compatible with Windows 10, 8, 7, Vista, XP (32 & 64 bit). Will NOT work with a MAC. Includes basic capture software. Captures images up to 2048 x 1536. Size & Weight: 15" high, 10" deep, 8.5" wide, 6 lbs. Includes: Dust cover, blue filter, software for camera.